The Stanley Weight Back Double Take hook is the perfect frog hook! The Weight Back hook sits lower in the water and creates more drag and splash. 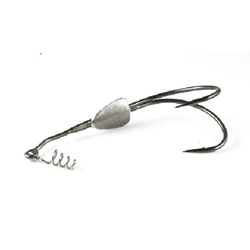 This Stanley Double Take hook adds extra weight for increases casting distances. The wedge shaped lead, plows threw the thickest vegetation.